In this program Joan will review the rules of Style, Design and Color for creating figure flattering quiltwear. Whether you are an x-small petite OR a voluptuous XXXX-L plus size you can create figure flattering quiltwear. This class is for fitting students with a custom fit jacket pattern. They may try on 34 muslin jackets, choose the best fit then do alterations onto paper pattern. This class is a full day for learning fitting and alteration techniques. Students may try on their choice of 34 muslin jackets. Then make alterations to paper patterns and test by cutting out and basting a muslin of their own. Each student will leave with a tried and true custom fitted jacket pattern. Aztec is a simple use of color to create a figure flattering look. Students learn how to create a garment on a muslin base then line it using simple quilter techniques. Students get to choose either the Purple Garden or the Midnight Glacier Designs. They will learn how to use bargello techniques to create unique figure flattering designs with 7 fabrics. Students learn how to make a jacket on a micro-fleece base, no lining required. This is a super simple design. With the right choice of colors this one looks great on everyone. 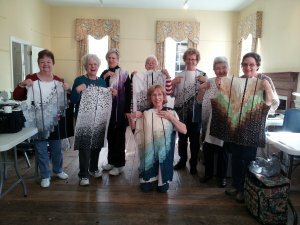 Students learn more artistic applications of fabric, using color value to create the design. This unique design looks slimming on all body types. Learn how to sew a great fitting vest no matter what your body type. Students learn how to use raw edge scraps to make a beautiful garment. They also learn tips and tricks for background stippling. If you have a bag of scraps this is the jacket for you. All jacket classes usually start with a short version fitting class, then go directly into the jacket design class. Here are some recommendations for guilds. An all encompassing quilted jacket workshop. Starts with a short fitting for a custom fit jacket pattern. Then goes into customizing a jacket design just for their own figure. Creating their own design pattern pieces. These skills can translate into other wearable art in the future. In addition to fees host organizations must cover transportation, meals and lodging expenses.